Looking for a simple and easy yet secure way of joining your chain or wire? Our rust resistant snap hooks are perfect for the job. Looking for a quick and easy method to join chain or wire rope? 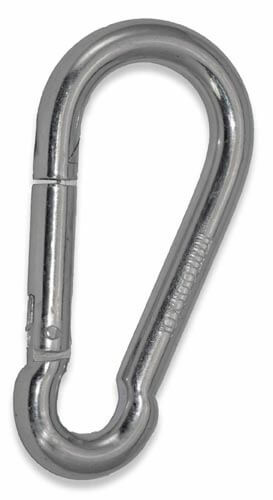 Our zinc plated snap hooks at perfect for little odd jobs such as securing your dog to a chain. A small spring within the snap hook closes the hook once it has latched onto something. Quick, easy and secure. Carabiners are a big thing in the rock climbing industry, but our carabiners are not rated for rock climbing. DO NOT USE.